Inbound marketing is a philosophy and methodology based upon the truth that the buyer’s journey has significantly changed over the last 10-15 years. It used to be that the buyer identified that they had a problem, picked up the Yellow Pages, phoned the company that had the biggest/best ad in the category they were looking for and were then sold to over the phone. As a marketer, we focused on interruptive outbound tactics such as cold calling, magazine and newspaper advertising, and leaflet drops in order to get noticed. A study by Forrester found that, on average, consumers have already conducted at least 12 pieces of research before they make contact with the vendor. They know what they want, how it works, what the problems are with it and, often, who they want to buy it from. Generally at the stage of the call, they’re just asking any final questions they may have and are looking for the best price. Therefore it is your responsibility as a marketer to ensure that your organisation is in front of the buyer at every stage of the buyer’s journey. Inbound marketing becomes marketing that people love. By producing quality content that provides genuine value to the consumer, you can become a welcome guest rather than an annoying interruption. At this stage, we’re producing activity that is going to get traffic to your website and content. But not just any traffic — targeted traffic, people that are interested in what you have to say and what you have to offer. When the consumer is on the website, we want them to be engaged with the content, download it and be prepared to leave their contact details such as name, email and phone number. The more valuable the content, the more details they’ll be prepared to leave. Once you have the consumer’s contact details, you’ll be nurturing them down the route towards becoming a customer. Again, you should be providing them with the right amount of relevant, useful information, establishing trust and credibility, and warming them up until the time is right for them or you to make personal contact. 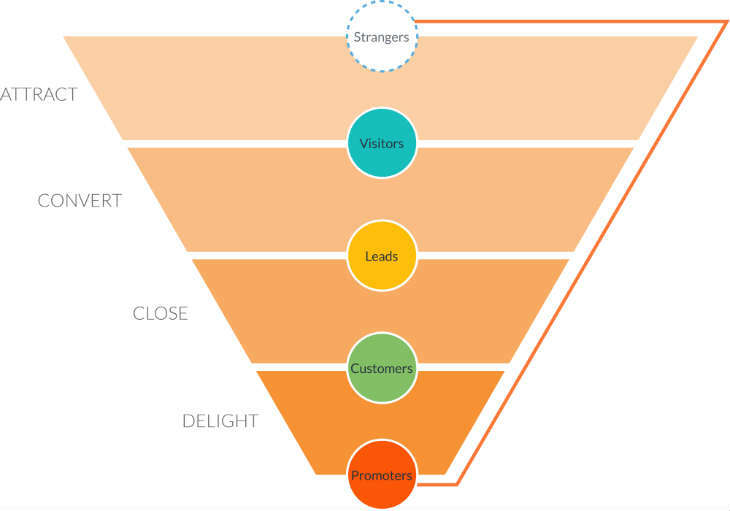 At this stage, you’re looking to convert your customer into an advocate, a raging fan who’s going to shout about how good you are and tell their friends/colleagues/peers, helping you feed the top of the funnel. You’re also going to be looking for an opportunity to up-sell/re-sell to the customer, driving up their lifetime value. Now that you know what inbound marketing is we’re now going to walk through the different elements needed to put together an inbound marketing campaign. What do we mean by a campaign? A campaign is defined as a marketing push centred around one single goal or message. They are often time-related, focused on a particular event, or around a particular piece of content. 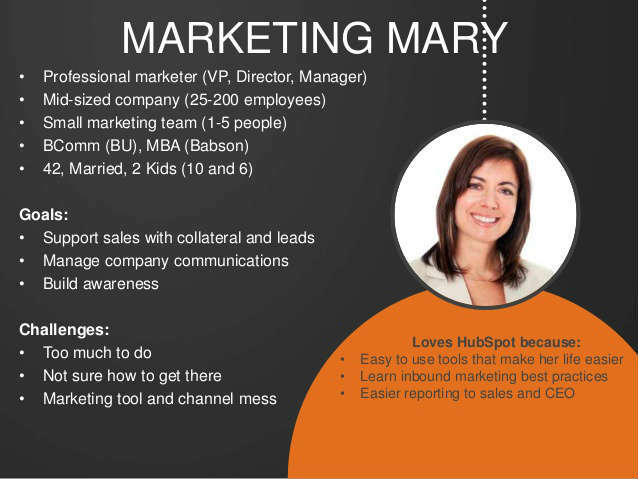 HubSpot provides a campaign tool, where everything can be reported automatically in one place. If you’re not using HubSpot, then it would be wise to create a spreadsheet to monitor the results and diarise weekly/daily events. A buyer persona is a fictitious representation of your ideal customer. You should aim to build a number of buyer personas based upon your existing customer base. You’ll want to document their age, income, gender, what goals and challenges they have and how you can help them. By building up as much detail as you can on the persona, you’re in a better position to create content that’s more relevant to them. Take, for example, a company that provides project management software. They may have different buyer personas, such as the Managing Director, Finance Director or Operations Director. Each will have different objectives and will be looking for different content. The MD, for example may want to know ‘5 ways your project management software will improve the productivity of your employees’. For the Finance Director, a report on ‘How project management software reduces costs and increases profitability’ may be more appealing. Whereas a report titled ‘The secrets to ensuring your projects are completed on time, every time’ may be more relevant to the Operations Director. An example of a smart goal would be, “I want to generate 100 new leads by 31st October”. This is specific, measurable and time-related. Depending upon your industry and the current traffic levels of the website it may or may not be realistic and achievable. Despite that terminology, a content offer doesn’t mean a discount or sale price, but a piece (or series) of content that educates your prospect about a given topic. The offer can be an eBook, a webinar (live or recorded), a white paper, a template, a checklist, or slide presentation. You should decide on the format of the content by considering the nature of it. Your goal in producing this content is for it to be a useful resource for the reader. You want them asking for more and engaging with your company. Therefore, your content has to create an excellent impression and establish yourself as the company of choice within your industry. With that in mind, ensure that the content offer contains useful and actionable insights that will be valuable to the reader. Don’t forget to include further calls-to-action that will further engage and entice the reader. The landing page is the place where your prospective buyer leaves their details in order to access your content offer and where, ultimately, you’ll be driving the traffic to. HubSpot has an inbuilt landing page creator, but if you’re not using HubSpot then other landing page tools like Unbounce, OptimisePress and Leadpages are available if you don't have your own in-house resource. Why do I need this offer now? Make sure that the header is clear and consistent with the call-to-action. Remove all other navigation so that the only thing that the visitor can do is either fill out their details or leave. Think about your formatting. Use bullet points and bolding to highlight the key messages. Include a relevant image. If it’s an eBook or whitepaper use a cover image. Do not ask too many questions. Generally, the more valuable the user perceives the content, the more info they are prepared to give you, but don’t ask them to jump through too many hoops. You can always test the impact the number and type of questions you’re asking has on conversion rate by running split tests. To deliver the content that they have requested. To give them another relevant offer that they can further engage with your company. There are a number of ways you can drive traffic to your new landing page. Create at least one call-to-action button that promote the content offer and links to the landing page, placing it wherever is relevant. For example, on relevant blog posts, in email signatures and in sidebars on pages of your website. You want as many people to see it as possible. Blogging is an ideal strategy for increasing both traffic and engagement on your website. A report from HubSpot shows that companies who blog 15+ times a month get five-times more traffic than customers that don’t, while companies who increase their blogging efforts from 3-5 per month to 6-8 per month, almost double their amount of leads. When deciding upon your blog titles you want to ensure that they naturally lead into an introduction to your content and display a call-to-action in the relevant place. Then the closing paragraph would introduce the content before displaying the call-to-action. If you have a good social media following it would be worth creating a number of posts promoting both the landing page and the blog articles. Use the Google Campaign URL Builder to ensure you can track social media traffic in Analytics. Depending upon the platform, you may want to create multiple posts. For example, because of the dynamic nature of Twitter, it’s acceptable to repeat the same or similar post a number of times, whereas with Facebook or LinkedIn this may appear spammy. If the blog posts you have created are not time-related, you can schedule them many weeks in advance. The aim of your landing pages and content offer is not just to get new people into the funnel, but to further engage with people that are on your existing list. Make sure that you are emailing to let them know about your latest piece of content and how it will help, or to let them know about your latest blog posts that they may find of interest. Once you have two or three pieces of content that relate to each other you can use email marketing automation to send your prospects a series of valuable and relevant content. You can utilise social media advertising, such as on Facebook or Twitter, to serve targeted advertisements to people you already have a connection with or that fall into audiences of people that may be interested in your offer. Likewise you can use Google AdWords to target long tail keywords that are related to your content offer or blog. A long tail keyword is one where it has at least three words within the phrase and they are generally cheaper than shorter, broader keywords. You could also use display ads, again targeted at audiences of people likely to want your content, or targeted at your existing email list. Once your content offer starts generating leads it’s important that you start to segment your database into separate lists so that, in the future, you can be serving more relevant information. Generally, when you use a landing page you’ll collate the data in some form of database or CRM (Customer Relationship Management) system. Most will have a system of tagging or list segmentation, and each contact should be segmented in a number of different ways. Are they a customer or prospect? What type of content have they been viewing? Depending upon the platform you’re using for your website and landing pages, it may be possible to personalise them based upon data you have collected in the previous step. For example, if a buyer persona of ‘Finance Director’ visits your website, you’ll get a higher engagement rate and conversion rate by serving them calls-to-action that relate to content offers that have a financial aspect to them. Or if a person is visiting your site multiple times, then you may want to assume that they are further down the buyer’s journey and doing more detailed research. You may then want to show them calls-to-action to download case studies or comparison guides, or offer them a free consultation. As you build your database of leads, it’s important to remember that people only buy when they’re ready to buy, not when you’re ready to sell. People will request information from you at different stages of the buyer’s journey and if you remember, from the opening paragraphs of this eBook, they may have researched thoroughly before making phone or face-to-face contact with you. With this in mind, you’ll want to make sure that you are maintaining contact with them multiple times and across multiple channels. You may wish to connect with them and reach out via social media channels such as LinkedIn or Twitter, and you should set up an automatic stream of emails that reinforces the information they originally received and leads them down the path towards making contact. Day 18: Email - Would you like to have a chat? From here, put them into a long-term nurture sequence or add them to your blog broadcast list (every time a new blog is published, you should have a list of people that you email with an excerpt and a link). Depending upon your product or service, you may have a longer or shorter nurture period. I’ve known people to be on an email list for over two years before they’ve made contact and gone on to become customers. Again it goes back to the fact that people only buy when they’re ready to buy, and therefore it’s your job as a marketer to keep in touch. By putting in place a long term nurture sequence, this will almost definitely give you an advantage over your competitors. Most companies will only make contact a couple of times before giving up on the prospect. Remember, people only buy when you’re ready to buy, not when you’re ready to sell. Therefore it’s important that you keep in touch, that you continue to nurture and that you continue to be top of mind whenever the prospect is thinking about a solution to their problem. At some point, you may want to take a more pro-active and personal approach to making contact with your prospects. Depending upon the nature of your organisation, you may want to pass the lead to your sales team/person or call them yourself. However, what happens if you have too many leads to make all those calls and at what stage do you make that call? The answer is lead scoring. As an overview, you assign a score to the person, depending upon what actions they have taken. For example, when someone opens an email they get one point, but if they haven’t opened an email, they get -1. If they click on a link on an email, they get five points, downloading a second eBook eight points, and if they visit more than five pages on your website or blog, they may get ten points. You may then decide to deem the prospect as being ready for a call, for example once they reach 30 points. Your scoring system will depend upon your individual business and the number of leads that you are generating. You’ll want to spend a bit of time creating your own scoring system that suits you. There’s an old adage that you can’t manage what you don’t measure, and this applies to your marketing. It’s really important that you know your numbers so that you can make decisions on what activities and assets are producing results and which ones aren’t. There’s a couple of clear metrics that you should measure for each aspect of your inbound marketing campaign. I’ll cover off the main ones here, but you’ll probably have others that are specific to your business or that are important to you. Once you’ve created all the assets and are driving traffic to your offers and content you’ll want to be continually tweaking and testing in order to get the maximum impact from your efforts,. For example, you may want to split test two different landing pages where the only difference between the two is that the headline is different or the number of fields in the form is different. Then, after sending a good sample of visitors to each one, measure the number of signups that you’ve had to each. You’ll probably find that there’s a clear winner: the one that gives the higher conversion rate. Archive the one with the lowest conversion rate and then create a new page with another single change and repeat the process. By continually doing these tests your opt-in rates will improve and you’ll get a predictable flow of leads into your business. As you will have discovered, to run a successful inbound marketing campaign there are many joined up elements. It takes time and effort to create all the assets and piece them together, and you’ll need systems in place that work together seamlessly. You’ll need a system to create all of the assets, for example a system for creating landing pages, for creating and publishing blogs, for promoting your content and an email system that will automatically follow up on your prospects and clients. Then you’ll need to pull data from each of these in order to provide meaningful reports. All of these systems are available in their own separate right, however, there are integrated systems available. Enjoyed discovering the wonderful world of inbound marketing? Complete this form and download this content as a free eBook. We hope that you find it useful for devising your first inbound campaign.